Angew. Chem. Int. Ed. 2018, 57, 7444-7447. This study demonstrates the bottom-up synthesis of silver nanolenses. 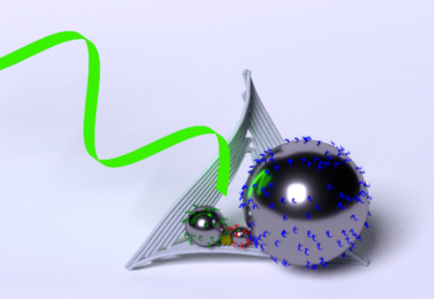 A robust coating protocol enabled the functionalization of differently sized silver nanoparticles with DNA single strands of orthogonal sequence. Coated particles 10 nm, 20 nm, and 60 nm in diameter were self-assembled by DNA origami scaffolds to form silver nanolenses. Single molecules of the protein streptavidin were selectively placed in the gap of highest electric field enhancement. Streptavidin labelled with alkyne groups served as model analyte in surface-enhanced Raman scattering (SERS) experiments. By correlated Raman mapping and atomic force microscopy, SERS signals of the alkyne labels of a single streptavidin molecule, from a single silver nanolens, were detected. The discrete, self-similar aggregates of solid silver nanoparticles are promising for plasmonic applications.